I wanted to name this series “Lessons from the Garden” because it sounds nice and gardens are beautiful. However, I kill plants inside and out on a regular basis so that seemed misleading. In truth, I spent much of the summer of 2016 weeding my front yard. It wasn’t glamorous, and it didn’t result in any splendid color around the lawn. I toyed with the idea of “Lessons from the Yard,” but I thought that title made it sound like I was in prison. I decided on “lawn,” and whatever you call it, I learned a lot from sitting in the grass for a summer. 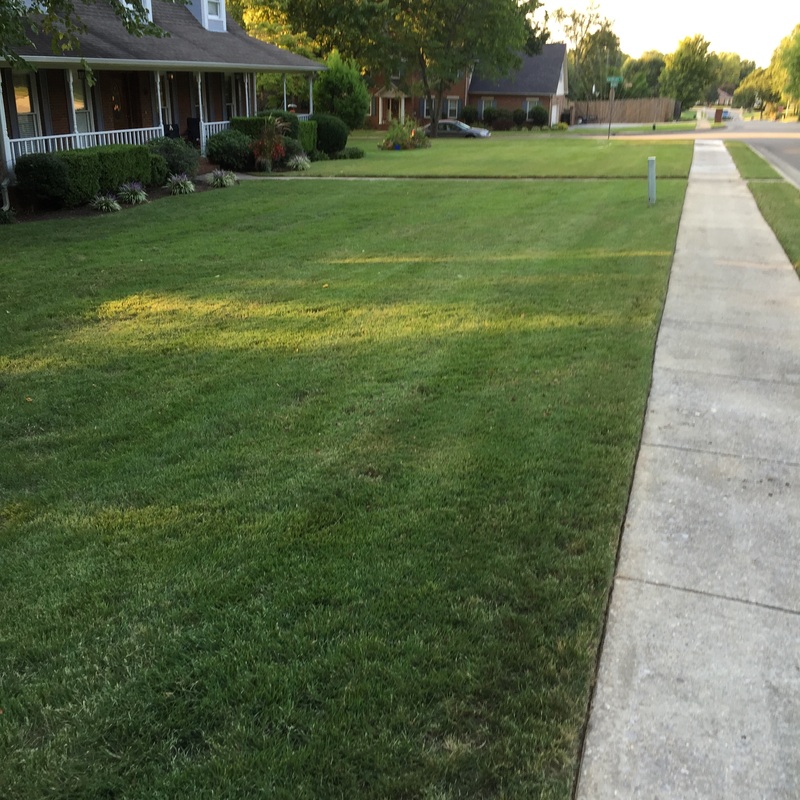 When I weeded the strip of grass between the sidewalk and the road, I had a lot of interaction with my walking neighbors. When I worked in the yard away from the sidewalk, sometimes people would speak or wave, but not always. However, it was impossible to pretend that I wasn’t there when they had to walk within a foot of me. In the beginning, the comments were not positive. The work was slow. That strip of grass was mostly a strip of weeds. The passersby said things like “aren’t you in the same spot as yesterday?” and “I have Roundup you can use if you want to get that done.” Sigh. On the whole, they were not very encouraging. Even I began to wonder if weeding the yard was indeed possible. However, I had a plan and a vision, so I plodded along. I made progress on the strip of grass and as I got close to the end, the tenor of the passing comments changed. They said things like “it’s looking good!” and “you are almost there!” Same people saying more positive things because now they could see that it was possible. By continuing to weed and move forward, I proved to them that it was a task that could be accomplished and that I had the determination to do it. Once they began to believe it was possible, and not a waste of my time, they became more encouraging. As leaders, we want to make things possible for other people by our example. I am a pretty assertive person, probably more assertive than most women. I’m not afraid of trying things, looking like a fool, or standing up for something that I believe in. Many times throughout my life, women have come up to me and said, “You will be so proud of me!” Then they go on to regale me with tales of how they stood up for themselves or spoke confidently in an interview. They usually say, “I was standing there thinking, ‘What would Kathy say?’” Ha! I’m honored and proud of them. Imitation is one of the sincerest forms of flattery. Great leaders are people that others want to emulate. When we lived in North Carolina, our next door neighbor was an older woman that my husband and I helped out sometimes. One of our jobs was to check under the house after a heavy rain to ensure that the sump pump was working. One weekend when my husband was gone, the sump pump wasn’t working. So, I went under the house and stood in the dark in about two and a half feet of water littered with swimming and dead camel crickets and checked the sump pump. It was just as gross as it sounds. Fast forward a few years, I now live in Alabama, but keep in touch with my friend in North Carolina. She called one day and said, “You are going to be so proud of me!” After a deluge of rain, there was water under the house. She went in, set the sump pump upright, and got it running. She said, “I thought, ‘If Kathy can do it, I can do it!’” I was proud of her and she did do it! It goes to show that you never know which of your actions will inspire others. Although I work to be an assertive and kind role model, I also am inspired by the accomplishments of others. I first noticed that someone could make the impossible possible for me with my beloved Veronicas. In 2006, I went through a six-month certification process for the Coaches Training Institute with eight other women and our leader. Our group was called the Veronicas, after the flower. At the end of our time together, we began a tradition of sending emails to each other on Friday with a list of what we were grateful for that week. We called it Grateful Heart Friday. Over the years, the Veronicas have turned out to be a powerful and motivated group of women. They are fellow coaches of varying ages who are out in the world getting stuff done. One has written for Huffington Post. Two have written books. One is successful corporate trainer. Another travels the world. Several have successful businesses. Every time one of the Veronicas accomplishes something, it makes it possible for me to accomplish. If they can do it, I can do it! Don’t read that last sentence with a nasty, sarcastic tone. I don’t mean it in a disparaging way. I love these women. They each had a dream that they accomplished, and I admire them for it. Their achievements are hugely motivating and inspiring to me. They make things possible for me by doing them. I originally called this concept of showing others what can be achieved by doing it yourself the 100-Dash Phenomenon. In my head, I had a story that no runner was able to break the 10-second barrier for many years. Then one day someone did! Once everyone else saw that it could be done, it became a more common occurrence. That is a great illustration of the concept, and I’ve carried it around with me for years! Unfortunately, it’s not true. The 10-second barrier for the 100-yard dash (not to be confused with the current 100-meter dash) was broken in 1890 by John Owen. He held the record with his time of 9.8 seconds for 16 years. I thought maybe the results for the 100-meter dash would be different, maybe that’s what I was thinking of. Nope. Jim Hines ran it in 9.95 seconds in 1968, and his record held for 15 years. It was such a disappointment to find out that my perfect illustration only existed in my head! Then, I reasoned that running the 100-yard dash is limited by the human body’s capabilities and not a good example anyway. I turned to the internet for a new story to illustrate the concept. Someone has to have talked about something seeming easier to do once seeing it done by someone else. When I searched online, I found articles about being threatened by the success of others which got me thinking. What if I had been threatened, rather than inspired, by the Veronicas’ success? It seems that there are different ways to view the success of others. As always, we get to choose. Do we look at the world through the lens of fear and jealousy or the lens of appreciation and support? Why would the success of any of these women, or anyone anywhere, threaten me? It’s an interesting concept to think about. For the record, you are unique and whole. You are not in any way diminished by someone else’s success. Thank them! They’ve made it feel more possible for you. When I think that I might want to do something, I look around for people who are already doing it. Inspiration and motivation can come from some strange places. My latest role model is an Australian hippy who regularly drops the F-bomb. She’s not the most likely inspirational candidate for a politically-correct leadership coach. However, she has an excellent business sense that my MBA brain appreciates. Her name is Leonie Dawson and she has created a multimillion-dollar business that offers training for entrepreneurs. She has created a business that mirrors the vision in my head; a vision that has felt too big sometimes. How can I ever get there? Now I know it’s possible and I have a guide. My business won’t be just like Leonie’s, and my success will never be a threat to her. Just by achieving, she is helping me. It’s a good idea to be open-minded about what your role model might look like. If you have a big dream, go out and find someone who has achieved it or something similar. Study them. Ask them! Many people are very generous in sharing how they got to where they are today. It’s so much easier when you know how they made it happen. If no one is out there doing what you want to do, you get to be the role model. Chunk down the vision into small steps, and prove to yourself and others that your vision is possible. You might help the next weeders who come along with a big dream and a big yard. fun leadership development, join 53 Leadership Challenges at KathyStoddardTorrey.com.